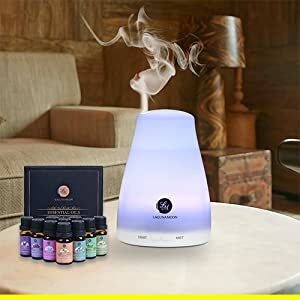 Achieve a deeper state of awareness with this Essential oils gift set, which includes Peppermint, Lemon, Rosemary, Orange, Eucalyptus, Lavender, Clove, Ylang Ylang, Patchouli, and Geranium each x 10mL bottle. These aromatherapy oils promote security, confidence, positive mood, and balancing effect on emotions. “Meditation Guru” increases cognitive functions, optimism, clarity, emotional balance, memory, clear thinking, concentration, positive mood, and confidence. LAGUNAMOON offers premium grade, natural and pure aromatherapy essential oils that are GC/MS Gas Chromatography–mass spectrometry tested, and without fillers. Our Essential Oils Set is suitable for any season. We at LAGUNAMOON believe that beauty comes not only from the outside, but also from the inside. It really should co-exist in harmony within the healthy body and mind. 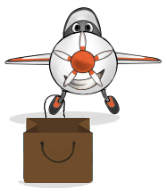 So we aim to bring health and beauty seekers like you unique natural goodness, through our newest and most affordable product lines in home, health, and fashion. 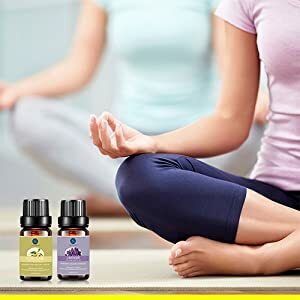 “Meditation Guru”: This themed set of LAGUNAMOON Essential Oils contains 10 of the most zen-like flavors --Peppermint (Mentha piperita),Lemon (Citrus limonum), Rosemary (Rosmarinus officinalis), Orange (Citrus sinensis), Eucalyptus (Eucalyptus globulus), Lavender (Lavandula angustifolia), Clove (Syzygium aromaticum), Ylang Ylang (Cananga odorata), Patchouli (Pogostemon cablin), and Geranium (Pelargonium graveolens) each x 10mL bottle. Invigorate your mind and senses with LAGUNAMOON Essential Oils. Beauty comes not only from the outside, but also from the inside. Fine, natural, chic. That’s what we represent. "Meditation Guru" kit are made of pure essential oils,each diffuser oil flavor carries its own unique properties. They are easy to mix and match for blending or dilution purposes.This essential oil s set are perfectly suitable gifts for any season. Enjoy a spa vacation, relax mind and body while moisturizing your skin with these essential oils,achieve greater sense of concentration and memory enhancement with this essential oils gift set. These aromatherapy oils promote security, confidence,positive mood, and balancing effect on emotions. “Meditation Guru” increases cognitive functions, optimism, clarity, emotional balance, memory, clear thinking, concentration, positive mood, and confidence. Achieve greater sense of concentration and memory enhancement with this essential oils gift set. Lemon Essential Oil encourages happiness and finding peace, relieves confusion, and carries a strong fresh, citrus aroma. Peppermint Essential Oil stimulates memory sharpness and clear thinking, decreases fatigue, and gives a strong mint aroma. Geranium Essential Oil promotes security and intimacy, alleviates mood imbalance and anxiety, and emanates a subtly sweet aroma. Lavender Essential Oil helps cognitive functions and calmness, lessens irritability and depression, and delivers a floral aroma. Eucalyptus brings about optimism and concentration, relieves sadness, and bears a strong camphoraceous aroma. Rosemary Essential Oil increases clarity and confidence, helps remove stress, and provides a warm and herbaceous aroma. Clove Essential Oil encourages memory and concentration, brings down fatigue and depression, and carries a warm and pungent aroma. Orange Essential Oil stimulates peace and confidence, decreases anger and fear, and gives off a warm and spicy aroma. Patchouli Essential Oil yields a balancing effect on emotion and groundedness, alleviates fatigue and stress, and emanates a musky, earthy aroma. Ylang ylang Essential Oil promotes calmness and positive mood, lessens withdrawal and anxiety, and delivers a pleasant, floral aroma. For dry hair ends, mix 1/4 cup of fractionated coconut oil, 7 drops of Geranium oil, 7 drops of Lavender oil, and apply a few drops of this serum to damp hair just after a shower. Let dry completely without a hair dryer. When you feel sore all over, add 10 drops of Lavender essential oil, 5 drops of Peppermint essential oil, 5 drops of Orange essential oil, 1 tablespoon of Jojoba carrier oil, and a handful of Epsom salt into a water-filled bathtub, and sit inside for at least 15 minutes. Mix, for example, 5 drops of Lavender essential oil, 4 drops of Orange essential oil, 1 drop of Ylang Ylang essential oil in a roller bottle, and fill it up with a carrier oil of your choice. 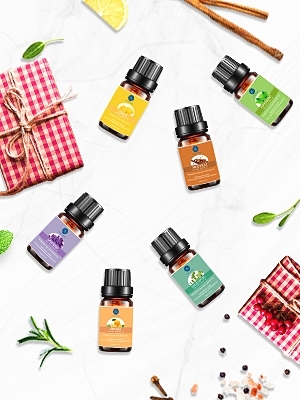 This essential oils variety pack is perfect for the home (bedroom, living room, bathroom, study room), office (workstation, conference room), outdoors, campground, yoga room, car, spa, and more! For external use only. Not recommended for ingestion. Avoid contact with eyes. Keep out of reach of children. Keep away from pets. For topical use, first dilute essential oil with carrier oil. Store in a cool, dry place. Please read the labels and instructions before use. If pregnant or nursing, consult with your health care provider before use. 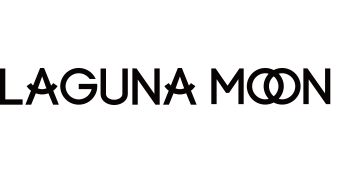 If you are interested in becoming an official authorized distributor or representative in your area and grow with LAGUNAMOON, please access our official website for detailed information. Mohon maaf, produk Lagunamoon Essential Oils Top 10 Gift Set Pure Essential Oils Gift Set for Diffuser, Humidifier, Massage, Aromatherapy, Skin & Hair Care sementara ini sedang habis.